As a CloudSMS Reseller,we will provide you with a complete end-to-end platform required for you to start your BulkSMS Service. 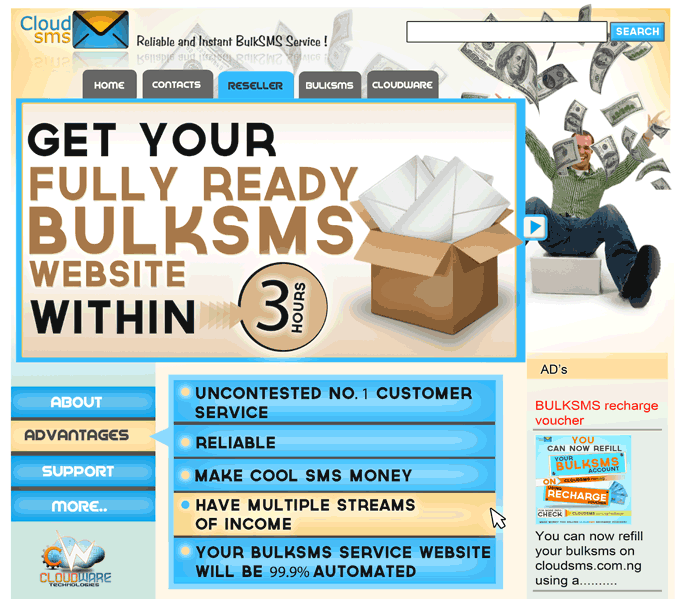 Building your platform on our secure and reliable platform is the wise choice for your BulkSMS business. API Reseller: if you have your own SMS management platform, and you simply want to use CloudSMS Reliable Gateway, we will assist you in integrating our API to be used by any platform you have, (this can be a software into which you want to integrate SMS API to enable the software/application to send SMS). White Label Re-seller: if you Don’t have an SMS management platform, using this re-seller category, you could abstract our platform and brand it as your own. So the current CloudSMS site will have your logo and all your company information, including Secure online payment that will be integrated before the end of the month. This re-seller type is recommended as it is secure and reliable, You will be hosted on our Cloud Servers and you will be given a domain name as part of the plan. Start introducing people to your BulkSMS company and start making Money!!! Activation time is 3 HOURS (you can begin to start making money via your SMS site within 3 hours from now)!!!! If you have further questions,please contact support@CloudSMS.com.ng or call 24/7 customer service desk on 0700CLOUDSMS / 08179092255. Get started with the reseller platform now.